Powerful website builder – Concrete5 ! Concrete5 is a free website builder that allows great customization of your new site and gives you various design opportunities. The concrete5 editor enables you to see the changes while you are making them directly on the page, so you can instantly add corrections. 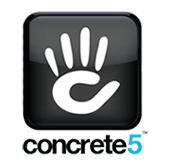 Concrete5 is suitable for both beginners and more advanced web masters. Websites using concrete5 are very flexible and can be developed even further if needed. With concrete5 you can also integrate different forms, maps, slide-shows, galleries etc. Concrete5 has very intuitive and easy to use admin section which makes it really good choice for web developers and beginners for their projects. The live site editor gives you the ability to use the drag and drop option and create really fantastic website. With the flexible and easy design mixed with the “What You See Is What You Get” editor, Concrete5 is wonderful software for your websites.